Knights by Aristophanes (c. 446 to c. 386 BC ), the greatest writer of Old Comedy, is a bawdy, incisive, and evocative satire on Athenian political life during the Peloponnesian War. The play is a fierce and sustained attack on one of the most popular politicians of the day, the pro-war demagogue Cleon, who had prosecuted Aristophanes for one of his earlier works. 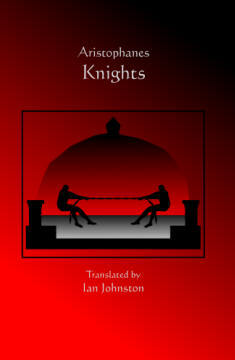 Beyond that, Knights is a scathing indictment of corrupt politicians in general (hence, very modern in its insights). In the play, two slaves decide to prepare a sausage seller, an uneducated ex-prostitute, for political life, on the ground that he already has all the necessary qualifications for successful leadership in democratic Athens. Their efforts culminate in a challenge to the most prominent leader of the polis and the eventual success of the sausage seller in taking over control of the city. Knights won first prize in the drama festival when it was first produced in 424 BC. Ian Johnston’s new translation captures the comic energy and the moral seriousness of this famous play. This text will be particularly useful for those who wish to stage readings or full productions of the play. The translation provides notes to assist the reader with the many references to Aristophanes’ contemporaries.